Who is going to win this war of predictions and on what cost? Let’s explore. I recently participated in this Kaggle competition (WIDS Datathon by Stanford) where I was able to land up in Top 10 using various boosting algorithms. Since then, I have been very curious about the fine workings of each model including parameter tuning, pros and cons and hence decided to write this blog. Despite the recent re-emergence and popularity of neural networks, I am focusing on boosting algorithms because they are still more useful in the regime of limited training data, little training time and little expertise for parameter tuning. 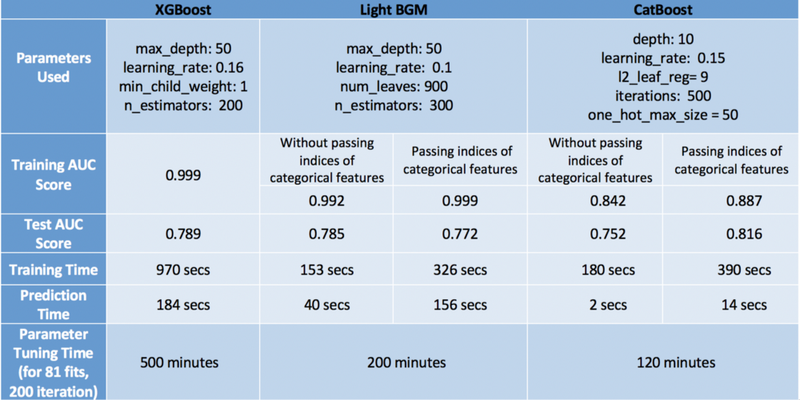 LightGBM uses a novel technique of Gradient-based One-Side Sampling (GOSS) to filter out the data instances for finding a split value while XGBoost uses pre-sorted algorithm & Histogram-based algorithm for computing the best split. Here instances means observations/samples. In simple terms, Histogram-based algorithm splits all the data points for a feature into discrete bins and uses these bins to find the split value of histogram. While, it is efficient than pre-sorted algorithm in training speed which enumerates all possible split points on the pre-sorted feature values, it is still behind GOSS in terms of speed. So what makes this GOSS method efficient? In AdaBoost, the sample weight serves as a good indicator for the importance of samples. However, in Gradient Boosting Decision Tree (GBDT), there are no native sample weights, and thus the sampling methods proposed for AdaBoost cannot be directly applied. Here comes gradient-based sampling. GOSS keeps all the instances with large gradients and performs random sampling on the instances with small gradients. For example, let’s say I have 500K rows of data where 10k rows have higher gradients. So my algorithm will choose (10k rows of higher gradient+ x% of remaining 490k rows chosen randomly). Assuming x is 10%, total rows selected are 59k out of 500K on the basis of which split value if found. The basic assumption taken here is that samples with training instances with small gradients have smaller training error and it is already well-trained. In order to keep the same data distribution, when computing the information gain, GOSS introduces a constant multiplier for the data instances with small gradients. Thus, GOSS achieves a good balance between reducing the number of data instances and keeping the accuracy for learned decision trees. How each model treats Categorical Variables? CatBoost has the flexibility of giving indices of categorical columns so that it can be encoded as one-hot encoding using one_hot_max_size (Use one-hot encoding for all features with number of different values less than or equal to the given parameter value). If you don’t pass any anything in cat_features argument, CatBoost will treat all the columns as numerical variables. Note: If a column having string values is not provided in the cat_features, CatBoost throws an error. Also, a column having default int type will be treated as numeric by default, one has to specify it in cat_features to make the algorithm treat it as categorical. Where, CountInClass is how many times the label value was equal to “1” for objects with the current categorical feature value Prior is the preliminary value for the numerator. It is determined by the starting parameters. TotalCount is the total number of objects (up to the current one) that have a categorical feature value matching the current one. Similar to CatBoost, LightGBM can also handle categorical features by taking the input of feature names. It does not convert to one-hot coding, and is much faster than one-hot coding. LGBM uses a special algorithm to find the split value of categorical features [Link]. Note: You should convert your categorical features to int type before you construct Dataset for LGBM. It does not accept string values even if you passes it through categorical_feature parameter. Unlike CatBoost or LGBM, XGBoost cannot handle categorical features by itself, it only accepts numerical values similar to Random Forest. Therefore one has to perform various encodings like label encoding, mean encoding or one-hot encoding before supplying categorical data to XGBoost. All these models have lots of parameters to tune but we will cover only the important ones. 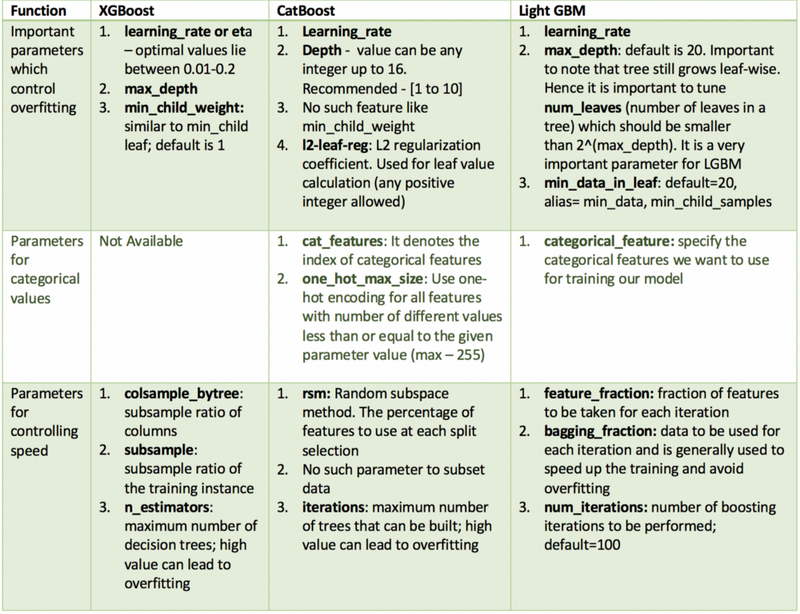 Below is the list of these parameters according to their function and their counterparts across different models. I am using the Kaggle Dataset of flight delays for the year 2015 as it has both categorical and numerical features. With approximately 5 million rows, this dataset will be good for judging the performance in terms of both speed and accuracy of tuned models for each type of boosting. I will be using a 10% subset of this data ~ 500k rows. While tuning parameters for CatBoost, it is difficult to pass indices for categorical features. Therefore, I have tuned parameters without passing categorical features and evaluated two model — one with and other without categorical features. I have separately tuned one_hot_max_size because it does not impact the other parameters. For evaluating model, we should look into the performance of model in terms of both speed and accuracy. Keeping that in mind, CatBoost comes out as the winner with maximum accuracy on test set (0.816), minimum overfitting (both train and test accuracy are close) and minimum prediction time & tuning time. But this happened only because we considered categorical variables and tuned one_hot_max_size. If we don’t take advantage of these features of CatBoost, it turned out to be the worst performer with just 0.752 accuracy. Hence we learnt that CatBoost performs well only when we have categorical variables in the data and we properly tune them. Our next performer was XGBoost which generally works well. It’s accuracy was quite close to CatBoost even after ignoring the fact that we have categorical variables in the data which we had converted into numerical values for its consumption. However, the only problem with XGBoost is that it is too slow. It was really frustrating to tune its parameters especially (took me 6 hours to run GridSearchCV — very bad idea!). The better way is to tune parameters separately rather than using GridSearchCV. Check out this blogpost to understand how to tune parameters smartly. Finally, the last place goes to Light GBM. An important thing to note here is that it performed poorly in terms of both speed and accuracy when cat_features is used. I believe the reason why it performed badly was because it uses some kind of modified mean encoding for categorical data which caused overfitting (train accuracy is quite high — 0.999 compared to test accuracy). However if we use it normally like XGBoost, it can achieve similar (if not higher) accuracy with much faster speed compared to XGBoost (LGBM — 0.785, XGBoost — 0.789). Lastly, I have to say that these observations are true for this particular dataset and may or may not remain valid for other datasets. However, one thing which is true in general is that XGBoost is slower than the other two algorithms. So which one is your favorite? Please comment with the reasons. Any feedback or suggestions for improvement will be really appreciated! Bio: Alvira Swalin (Medium) is currently pursuing Master's in Data Science at USF, I am particularly interested in Machine Learning & Predictive Modeling. She is a Data Science Intern at Price (Fx).